"These cute little guys will be a hit at any kids party, fun get-together, or in a child's lunchbox!" Cut hot dogs in half. To make the 'legs' of the octodog, make 3 cuts on 1 side of each hot dog, leaving about 1/3 the rounded top of the hot dog for the 'head'. Turn hot dog over and make 3 more cuts, so you have 8 'legs'. Place the octodogs in the boiling water until cooked through and the 'legs' curl up, about 1 minute. Try these cute & delicious personal “mummy” cheese pizzas. You can use sesame seeds or bits of nori (dried seaweed) to create little faces on the octodogs if you wish. These guys have a lot of character on their own though! 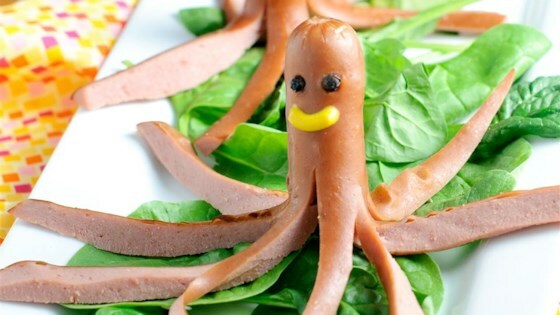 Use different sizes of hot dogs to create different sized octodogs! Rating a five for cuteness! My grandkids love hot dogs and what kid wouldn't get a kick out of these? My 3-year old just loved these! He already likes hot dogs but making crazy animals with them just made it more fun. Thanks for the great idea! Our whole family loved this cute idea. We floated ours in a sea of chili! My grandsons LOVED these. I set one over a bowl of chili, and the other on top of the hot dog bun. So cute.